Hotels in Mesquite say they have already lost more than a $100,000 in business because of armed militia groups patrolling Bunkerville. 8 News NOW has learned Mesquite Police are investigating death threats to hotel staffers following a bomb threat earlier this month. The threats were reportedly called in by supporters of Cliven Bundy, the Bunkerville rancher battling over his cattle with the Bureau of Land Management. Democratic Representative Steven Horsford says people are living in fear, under the constant presence of armed militia groups. 8 News NOW investigated those claims and found that while people from some of the top hotel chains didn't want to go on camera, the dispute is costing them, and the community, plenty. As armed militia groups poured into Bunkerville to support rancher Cliven Bundy, so did threats. One Mesquite city leader said the entire Holiday Inn Express was evacuated for hours following a bomb threat related to the Bundy saga more than two weeks ago. 8 News NOW obtained a police report which also shows the hotel received at least nine threatening phone calls in April, after they allowed BLM rangers to stay in the hotel. Workers were told to kick out the BLM or they "would not be standing in the morning." One Mesquite hotel worker, who didn't want to go on camera, said he was told by an anonymous militia member that he would be "dragged out in the parking lot and shot". "We are not a playground for armed militias." Rep. Steven Horsford, D-Nev., said during a meeting with area leaders about the militia last week. Now lawmakers say these out-of-state, armed Bundy supporters need to go. "This unfortunate incident and the outside groups that have come for their own agenda are putting a black eye on this community," Horsford said. Bundy’s legal fight with the federal government appears likely to continue to drag on for several years. Many supporters, some of them armed, have stayed on to ensure that the rancher can continue to graze on federal property. Although it’s unclear how long Bundy’s supporters intend to remain in the Bunkerville area, a fight last week between militiamen and the Oath Keepers, an organization committed to defending the U.S. Constitution, could signal that support for the rancher has fallen into disarray. Angered militiamen were caught on tape last week denouncing the Oath Keepers after the group’s founder, Stewart Rhodes, evacuated his members from the area following rumors that Attorney General Eric Holder had called in a drone strike. Dear readers- you just can't make this stuff up. If it weren't so potentially dangerous, it would be laughable. The guys with the guns are trying to make the rules in America. Let's hope they won't succeed or we will no longer be a democracy. Scary thought. Gun rights activist Mike Vanderboegh got the "troops" fired up by threatening to castrate Senate Majority Leader Harry Reid. Why? Because he dared to call those who came to the defense of Nevada rancher Cliven Bundy domestic terrorists. The truth hurts. Seeing weapons featured in a public protest might strike many Americans as outrageous or alarming — something more out of a CNN segment from a foreign conflict zone than in a live broadcast from the steps of the local state capitol. But the courts have held that distressing and outrageous speech is still protected, and that even calls for the overthrow of the government made at armed rallies are protected unless those statements are expressly intended to provoke “imminent lawless action.” The Supreme Court has also extended protection to hyperbolic and figurative speech even when it involves ostensibly threatening the president. Contemplating guns as speech, we confront a kind of autoimmune disorder: The tools once instrumental to the birth of our nation, and to the protection of the individual and the state alike, are increasingly turned against both. Guns historically used to midwife and safeguard the right to free speech are now growing ever more cross-wired with it, and speech cannot but be degraded in the process. Citizens in a democracy make a certain pact with one another: to answer speech with more speech, not violence. No matter how angry what I say makes you, you do not have a right to pull a gun on me. But now the gun has already been drawn, nominally as an act of symbolic speech — and yet it still remains a gun. 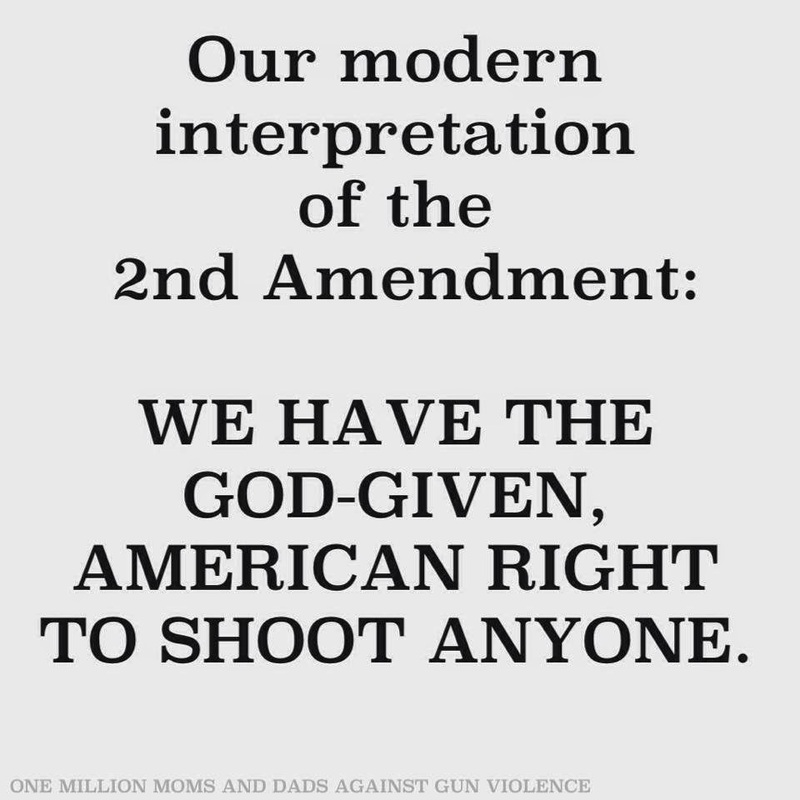 A slippage has occurred between the First and Second Amendments, and the First suffers as a result. The moral bravery political protest demands is no longer enough; to protest in response now requires the physical bravery to face down men with guns. This situation is alarming, but it is also tragic. Asking after the propriety of guns in the public square ignores a basic reality: They are already there, and not just in ambiguously threatening demonstrations. We live in an era in which mass shootings have become a tacitly accepted feature of social life. Any space, public or private — offices, movie theaters, malls, street corners, schools — can be transformed at a moment’s notice into the site of a blood bath. Wherever we go, our existence as social selves — our vulnerability to one another in democratically shared spaces — is in the firing line. As I and others write every day, Americans are on the firing line in schools, homes, work places, shopping malls and wherever we gather. You can read Joe Nocera's latest The Week-End Gun Report for more on this truth. There are too many tragedies in this latest blog starting with an argument that began over Facebook between two young teen-aged girls which ended in a shooting. One is dead. You can read more about where the gun came from and how easily it went from being a legally purchased gun to becoming an illegal gun that was used senselessly in a tragic shooting. This is every day America. Is this what we want it to be? But more on the gun extremism in America. The best example of the tactics of the gun rights extremists has to be what has gone on with the attempted release of a new type of gun to the marketplace. One would have thought this was the end of the world or something. A Baltimore area gun dealer decided to sell a new type of gun using "smart gun technology" in his gun shop. That is, until the gun rights extremists starting sending him death threats. These are the folks who flex their muscle at any mention of doing something that could actually save lives like some common sense laws. Chris Hayes of MSNBC has been exploring this story in depth. You can watch the latest episode here and also others that aired in the past few days. Raise your hand if you think it makes sense for the corporate gun lobby to be making such a fuss over a gun that could potentially save lives. The conundrum for the gun extremists is that they want everyone to believe that a loaded gun in the home will protect them from all of their ramped up fears, up to and including zombies. But the truth is that loaded guns in homes account for a good many accidental gun deaths and suicides instead. So if your gun is a "smart gun" ( see above link) it can only be used by the person who owns it and there is a possible delay in having the gun at the ready to shoot all of those armed intruders or other dangers lurking around the home. There are real dangers out there for certain. But the risks of a loaded gun at home don't outweigh the benefits. And that is where the culture of the gun extremists diverges from most of the rest of us. Haros told Channel 5 that police should understand that for people like him to openly carry firearms helps law enforcement. Bush said in his email that there are better ways to help the police. “We respect the rights of all citizens to peacefully protest and the right to bear arms. However, we cannot stress enough how a simple phone call to police prior to this demonstration and the use of easily visible signage could have avoided unnecessarily alarming the public,” he said. "It's just for safety purposes." Baloney. People were perfectly safe without these guys. They are not adding to the safety of the folks in the restaurant. The chances of an armed "bad guy" showing up are very slim. This is about intimidating people, plain and simply. The guys with the guns do not get to make the rules. The rest of us are beginning to see what this is about. And it's not about safety. Speaking of "Jack-In-The-Box" restaurants, I think I am going to personally avoid them. At the bottom of the article I posted were a number of unsavory and disgusting incidents, among them, this one when a man pulled a replica gun on someone after a fight. As someone on my Facebook page said about a different gun incident, whatever happened to fist fights? Not in America where people with guns are getting bolder and bolder with those guns in public places. What's the point? As popularity has grown, problems have too. Problems that county employee's say wouldn't happen if everyone followed the rules. Resident Dave Behrend says most people do follow the rules, but the few that don't, are concerning. The gun range bathroom is riddled with bullet holes. People have been seen shooting explosive targets even though only paper targets are allowed. "I left Fleet Farm and a gray pick-up truck and a red pick-up truck followed me, pulled into the rifle range, unloaded and I think they brought the Civil War with them!" Behrend says. Just in the last few weeks people were caught "shooting propane tanks, starting grass fires," says Duggan. The incident was confirmed by police. "When there's no supervision people have a tendency to not follow the rules," says Duggan. He believes on-site range supervision would keep things under control. "It is controlled," says Deputy Troy Sherman with the Oconto County Sheriff's Department, "but you're always going to have that one percent that want to try something they've seen on TV." The thing is, guns are dangerous weapons designed to kill people. There simply can't be carelessness. All it takes is one person to kill someone with a stray bullet to make this an unnecessary and avoidable tragedy. Why are we so careless with guns and gun rights? I thought these were the guys who want everyone else to enforce the laws already on the books. There is more to come. More and more and more avoidable and senseless gun deaths and more extremism. Where does it stop? Will we get involved and demand change or will we sit by and watch this extremism get so out of control that our country's democracy is threatened? We just have to be better than this. There is much more where this came from. Some days it's hard to know where to start. But I know for certain that what is going on all over America cries out for a solution. And our elected officials are ignoring it for fear of angering the "guys with the guns." Making public policy should not be done out of fear. It should be done with integrity and public health and safety in mind. For without that, we are not a country whose values reflect who we are and who we should be.